Welcome to the official web site of MySecretFolder! 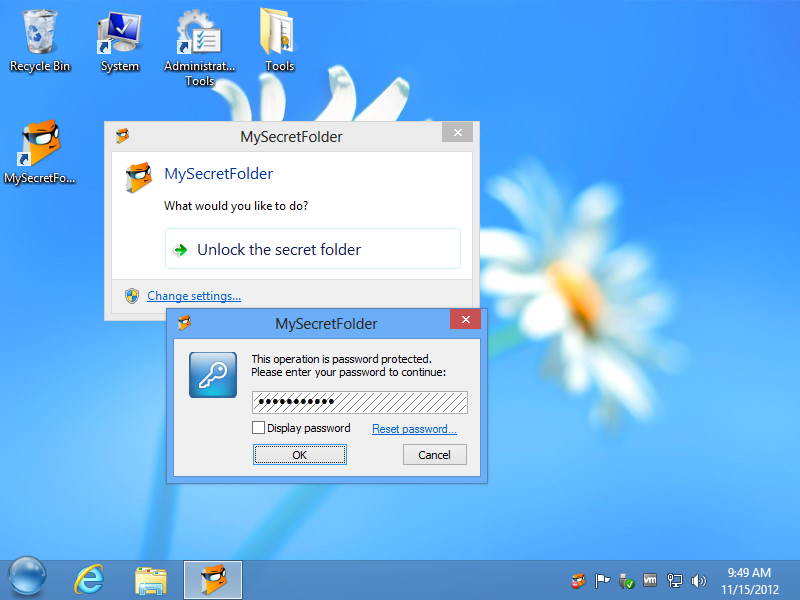 MySecretFolderTM is a powerful yet easy to use Windows program that you can use to hide your private folder (and the files it contains) from other users of your computer, and to lock the folder with a password. Unlike the built-in security of Windows, MySecretFolder does not require your hard drive to be NTFS-formatted: MySecretFolder can protect a folder on both FAT/TAF32 and NTFS disks. Is MySecretFolder hard to use? MySecretFolder is extremely easy to use, you don’t have to be a computer professional to start using it in just a few minutes. Simply download the installation file, run it to install MySecretFolder on your computer, then select the folder you want to protect from other users, choose a password, and you are ready to go! Click on the Protect button and the folder will become hidden or password protected. Only you (or someone who knows the password) can make the protected folder visible or unlocked.